The Conservative Treehouse posted an article today that featured some remarks made by Devin Nunes on the Laura Ingraham Show. The article includes a video of the discussion. Somehow I don’t think Mueller was an objective Special Counsel. We seem to learn something every day that questions his objectivity in the investigation of something that never happened and that he probably knew never happened very early in the investigation. It gets even more interesting–the article cites an energy deal that George Papadopoulos was a part of in the Middle East. Some Democrats have long memories, nasty tempers, and are willing to wait for revenge. The Conservative Treehouse posted an article today about the closing of the General Motors plant in Lordstown, Ohio. The article points out that with the auto industry expanding its manufacturing in the United States, it makes no sense to close down an automobile manufacturing plant. …In just the past few months, specifically as an outcome of the USMCA, six auto companies have decided to massively expand U.S. operations and spend over $20 billion on auto-manufacturing investments in the U.S. It makes no sense for an existing auto plant to sit idle. Come to terms with the UAW; make a good deal that helps membership and incentivizes ownership; sell the facility to a new group expanding U.S. investment; retool, and get people back to work. Evidently the problem is the inability of General Motors to reach an agreement between GM CEO Mary Barra, and the UAW leadership. If General Motors intends to be a major part of the automobile market in the future, they need to work out a deal with the UAW and put people back to work. The article states that this is a direct outcome of the NAFTA replacement USMCA trade deal; and the new 75% rule of origin within the Auto sector. The guiding decision here relates specifically to the construct of the USMCA (NAFTA replacement). Toyota was previously focused on multi-billion-dollar investments in Canada as they exploited the NAFTA loophole and procured component parts from Asia for North American assembly and shipment into the U.S. Market. However, when they renegotiated NAFTA and created the USMCA President Trump and USTR Lighthizer closed closed the loophole. The new USMCA agreement requires that 75% of automobile parts must be made in North America; and 45% must come from plants with minimum labor costs ($16/hr); or face tariffs to access the U.S. market with the finished good. As a result Toyota has to either pay a tariff to continue importing Asian component parts, or move the higher-wage component manufacturing directly into the U.S.
Obviously, Toyota chose the latter. Keep in mind Toyota is not the first Auto manufacturer to respond with increased U.S. investment. Prior to the USMCA German auto-maker BMW began building a $2 billion assembly plant in Mexico. Under the old NAFTA plan most of BMW’s core parts were coming from the EU (steel/aluminum casting components, engines, transmissions etc.) and/or Asia (electronics, upholstery etc). However, under the USMCA the Mexico BMW assembly plant has to source 75% of the total component parts from the U.S, Canada and Mexico; with 45% of those parts from facilities paying $16/hr. The result was BMW needing to quickly modify their supply chain, build auto parts in the U.S. and Mexico, or they would end up paying a tariff on the assembled final product. Like Toyota, BMW made the financial decision to open a new engine and transmission manufacturing plant in South Carolina…. exactly as Trump and Lighthizer planned. Like him or not, President Trump is a businessman who is doing things that are helping the American economy and the average worker. The mainstream media spends a lot of time criticizing President Trump. He is characterized as someone who is totally incompetent, undisciplined in his decision making, volatile, stupid, uneducated, etc. Yet it is somewhat amazing what this man has accomplished in less than two years–with the drag of constant accusations and investigations, a hostile press that simply ignores anything he has accomplished, and a Congress that has been less than supportive. The Conservative Treehouse posted an article today that highlights how the Trump economy is doing. …Wall Street is being impacted by their multinational reliance which is heavily weighted toward global investments. Main Street is driven by the actual U.S.A. checkbook economic factors. This is the modern disconnect. After decades of Wall Street companies investing overseas, and generating investment products that are fundamentally detached from the U.S. economy, they do not benefit from a strong U.S. economy. 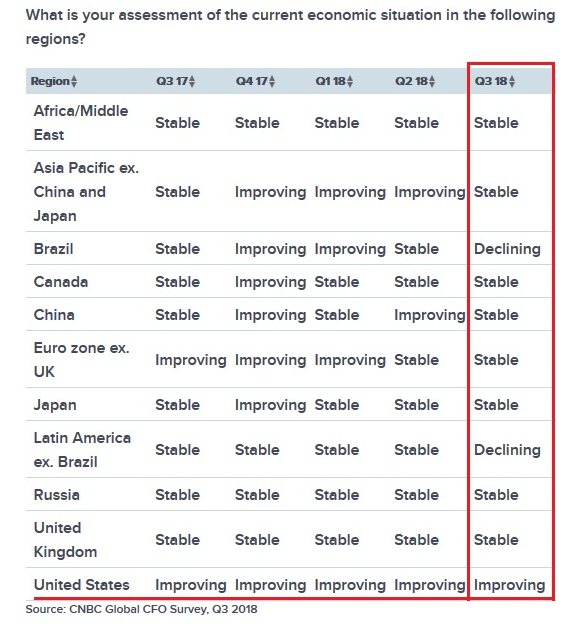 However, Main Street directly gains from internal U.S. economic growth. …If you understand the basic elements behind the new dimension in American economics, you already understand how three decades of DC legislative, monetary and regulatory policy was structured to benefit Wall Street and not Main Street. The intentional shift in monetary policy is what created the distance between two entirely divergent economic engines. The support of Main Street instead of Wall Street is one of many reasons the Washington establishment hates President Trump. Under establishment politicians Wall Street and rich investors have done very well in recent years–at the expense of Main Street. President Trump has changed that. I strongly suggest that you follow the link and read the entire article at The Conservative Treehouse. It explains in detail how President Trump’s economic policies have changed the dynamics of the American economy. The American economy is improving for average Americans. The elites who have profited greatly in recent years while the rest of us struggled do not like that. Be prepared for an outright onslaught of negative news about President Trump as the middle class continues to prosper. The U.K. Telegraph reported on Wednesday that MI6 chiefs are secretly battling Donald Trump to stop him publishing classified information linked to the Russian election meddling investigation. It forces the spotlight on whether the UK played a role in the FBI’s investigation launched before the 2016 presidential election into Trump campaign ties to the Kremlin. In 2016 candidate Trump supported Brexit; the professional political class in the U.K. were vehemently against it. Additionally, candidate Trump was openly challenging the structure of NATO and demanding changes to the alliance. This was antithetical to the interests of the U.K. government and likely sent shockwaves through their collectivist system when candidate Trump won the GOP nomination. The Brits had a strong motive to see Trump destroyed and aligned with weaponized U.S. intelligence toward that end. Lastly, the U.K. and E.U. (mostly German anxiety) are facing a much tougher trade objective as outlined by President Trump. The trade conflict is costing them billions in addition to their increased need to spend on their own defense via NATO to keep Trump off their back. He might be just one man, but President Trump has them surrounded. President Trump is not allowing the same one-way benefits within the U.S. trade relationship with the EU; and as he highlighted with the use of tariffs, he is not hesitant to smash the EU economy (mostly Germany) with crippling auto-tariffs if needed. Trump is leveraging access to the U.S. markets as pressure on the Europeans to comply with U.S. demands. The Europeans, including the British, are not used to this level of confrontation from the U.S. Their economic frames of reference surround acquiescence from prior American presidents. They are increasingly unnerved and the horrible President Trump simply doesn’t care. And then there’s the newly emphasized Iran sanctions… the economic MOAB that threatens any/all European interests who might dare to get caught doing business with the Iranian regime. President Trump has shown he is not the least bit hesitant to pull the trigger on Treasury penalties against any nation or multinational interest who would defy the sanctions. Simply put, the Brits did not like the idea of an American President who put America first. The question remains as to what they actually did about it. 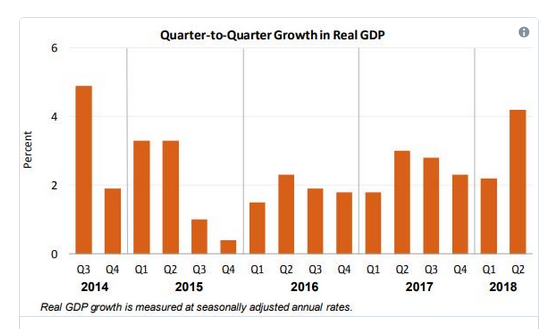 Yesterday The Conservative Treehouse posted an article about the growth of the American economy under President Trump. I suggest you follow the link and read the entire article. It is a fairly detailed analysis of what has happened due to de-regulation and tax cuts. It is time that the average working American got a few economic breaks. President Trump is providing those breaks. Yesterday The Gateway Pundit posted an article about Deputy Attorney General Rod Rosenstein. He has refused to appear before the House Judiciary Committee and will not turn over the subpoenaed documents to the Committee. According to multiple reports, Deputy Attorney General Rosenstein has given a verbal resignation to Chief of Staff John Kelly following an explosive NYT report he wanted to wear a wire and oust Trump from office. Last week, Freedom Caucus Chairman Mark Meadows (R-NC), who previously filed articles of impeachment against Rosenstein, called for the Deputy Attorney General to appear before Congress under oath this week. But today Rosenstein notified Congress he will not turn over the subpoenaed memos and will not appear before the House Judiciary Committee on Thursday. Exposing the FBI/DOJ dirty deeds is a major priority for a contingent within congress and a multitude of Trump supporters – but for the office of the President, in the immediate future, not-so-much. When you have this much leverage on someone, you don’t want them to quit. You want to use their damaged and tenuous position to your advantage. President Trump is in no hurry to fire Rosenstein (not yet), because the DAG is so weak and President Trump holds all the leverage in the relationship. Rod Rosenstein knows what he did wrong; and President Trump knows what Rosenstein did wrong. Though it could change based on new discoveries of how far the DAG went along within the soft-coup process, President Trump isn’t likely to let Rosenstein go until everyone else knows what Rosenstein did wrong. My question amid all of this palace intrigue is, “Does Congress have legal recourse to get the documents they want and to force Rosenstein to appear?” Can the Democrats run out the clock in the hopes of taking control of Congress? If they are successful in doing that, we can expect more corruption and politicization of these agencies in the future. We can expect Republicans and conservatives to be under constant surveillance and attack. I don’t think that is what American voters want. Stay tuned, this is going to get interesting. Posted at YouTube on October 7. An article with more detail is posted at The Conservative Treehouse. It is long, but well worth reading. The National Federation of Independent Business (NFIB) just released another survey. 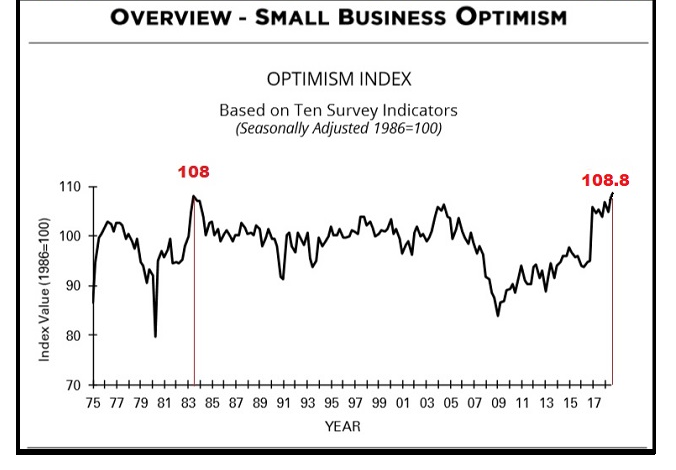 The Small Business Optimism Index has soared to 108.8 in August; that’s an all-time record in the survey’s 45-year history, topping the July 1983 highwater mark of 108. This incredible surge in economic outlook began with the era of President Donald J Trump. “At the beginning of this historic run, Index gains were dominated by expectations: good time to expand, expected real sales, inventory satisfaction, expected credit conditions, and expected business conditions,” said NFIB Chief Economist Bill Dunkelberg. 26% of companies plans to increase employment. 38% of companies have current job openings. 34% of companies consider this a good time to expand. 34% of companies expect the economy to improve. Economic policies make a difference. 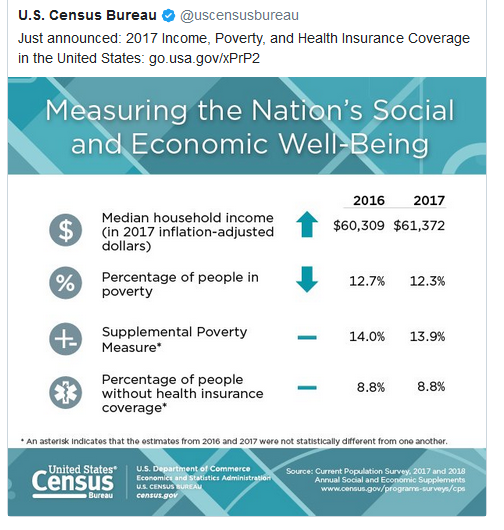 This is President Trump’s recovery. If you would like this recovery to continue, I suggest you elect Republicans to Congress in November. If you elect Democrats, they will quickly end the tax breaks and other policies that have resulted in this exceptional economic growth.